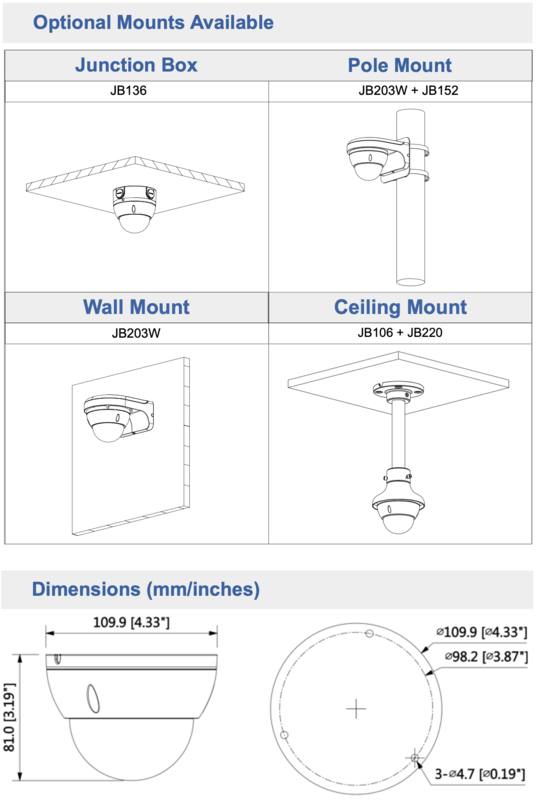 The 3MP Dome Camera is a small and compact IP camera with a 3 Megapixel image sensor that provides video better than 1080P, and has a wide angle 2.8mm Lens and 100 feet of night vision. Its clear glass cover and small size makes it desirable for use where a discrete camera is needed such as home or office, or on the front of a home. It offers a lot of value for its reasonable price and is our recommended 3mp IP Dome Camera since it is also vandal resistant and impact resistant to IK10 standards. It is IP67 weather proof rated, which makes it suitable for use outdoors in rain or snow without worry for overhead shelter from an eaves. I want to buy 16 of these, but there is no mention of the protocols used. I am using a bandwidth calculator and it it asking what type of stream this camera uses. Is it H.264, MPEG-4, or MJPEG? Need to know. We are purchasing online tomorrow, 10/19/2016. Any help would be appreciated. All of our ip cameras and nvr allow for encoding using h.264 or mjpeg. This is an IP camera. As discussed in our security camera guide, IP cameras are network based cameras that require a network cable. You could use an ethernet over coax converter to transmit a network signal, but they are expensive accessories that are rarely used. If you are looking for high resolution video from your existing RG59 cabling, we suggest using HD over Coax cameras found here. Ensure that the cabling you have was taken from a spool of wire, and not pre-made cabling of low quality. Compatible with a Speco N16NS9TB Recorder? Our POE is a D-Link Switch. Our testing shows that this camera does provide a video feed back to this model NVR. What is the POE voltage? Is it still 12vdc and if so, do you have a recommendation on a 24 port POE switch that would work with these cameras? You can use this 24 port PoE switch with our PoE security cameras.